It’s not really a secret that I don’t like Donks, I don’t really see what there is to like about them and I’m quite thankful that around here they are few and far between. For those of you from the Southern States I feel for you as I could not imagine seeing rides like these on a regular basis, this poor Kompressor never stood a chance. Here are two videos of this thing moving. One under construction and one complete. I have yet another featured ride from Division R coming up and I am going to work on lining up another photographer feature soon as well. This weekend there are two car shows going down, ImportExpo and Tuners Against Street Racing and since I can’t be in two places at once I’ve decided to go to T.A.S.R because not only is it a charity show but I am sponsoring an award with a photo shoot by Elle Marie Photography. Which award? Well you will just have to attend to find out. On the personal front my shipment from BC racing has arrived and is actually getting installed right now so after work today I should be rid of that pesky front fender gap that has been the bane of my existence since putting the coil overs on my ride. Since I will be at this show tomorrow it only makes sense to throw it back to last years Tuners Against Street Racing Coverage. Dope looking Golf from past year, Pedo bear is watching. 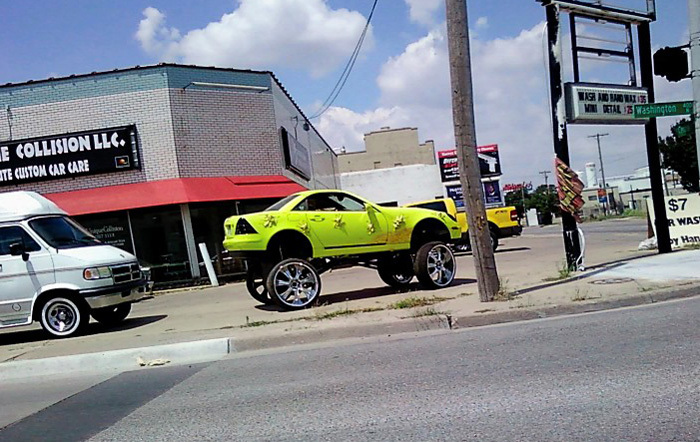 I’m from the south, and I can appreciate donks at times. I can appreciate them but they’re about the polar opposite of my taste personally(smaller, agile, FAST cars fit my taste). I can appreciate them on an old P.O.S. Chevy Celebrity, Caprice, or Impala, or old Fords, etc or any other car that is worthless otherwise to fix up. But a Kompressor donk is just sacrilege. How could you be proud of THAT? and that cuz its just brutal! Theme Tuesdays: Now Who Makes The Music?